During 10 years of discovery, NASA’s Cassini spacecraft has pulled back the smoggy veil that obscures the surface of Titan, Saturn’s largest moon. Cassini’s radar instrument has mapped almost half of the giant moon’s surface; revealed vast, desert-like expanses of sand dunes; and plumbed the depths of expansive hydrocarbon seas. What could make that scientific bounty even more amazing? Well, what if the radar images could look even better? Thanks to a recently developed technique for handling noise in Cassini’s radar images, these views now have a whole new look. The technique, referred to by its developers as “despeckling,” produces images of Titan’s surface that are much clearer and easier to look at than the views to which scientists and the public have grown accustomed. Typically, Cassini’s radar images have a characteristic grainy appearance. This “speckle noise” can make it difficult for scientists to interpret small-scale features or identify changes in images of the same area taken at different times. Despeckling uses an algorithm to modify the noise, resulting in clearer views that can be easier for researchers to interpret. Antoine Lucas got the idea to apply this new technique while working with members of Cassini’s radar team when he was a postdoctoral researcher at the California Institute of Technology in Pasadena. “Noise in the images gave me headaches,” said Lucas, who now works at the astrophysics division of France’s nuclear center (CEA). Knowing that mathematical models for handling the noise might be helpful, Lucas searched through research published by that community, which is somewhat disconnected from people working directly with scientific data. He found that a team near Paris was working on a “de-noising” algorithm, and he began working with them to adapt their model to the Cassini radar data. The collaboration resulted in some new and innovative analysis techniques. “My headaches were gone, and more importantly, we were able to go further in our understanding of Titan’s surface using the new technique,” Lucas said. As helpful as the tool has been, for now, it is being used selectively. “This is an amazing technique, and Antoine has done a great job of showing that we can trust it not to put features into the images that aren’t really there,” said Randy Kirk, a Cassini radar team member from the U.S. Geologic Survey in Flagstaff, Arizona. Kirk said the radar team is going to have to prioritize which images are the most important to applying the technique. “It takes a lot of computation, and at the moment quite a bit of ‘fine-tuning’ to get the best results with each new image, so for now we’ll likely be despeckling only the most important — or most puzzling — images,” Kirk said. Despeckling Cassini’s radar images has a variety of scientific benefits. Lucas and colleagues have shown that they can produce 3-D maps, called digital elevation maps, of Titan’s surface with greatly improved quality. With clearer views of river channels, lake shorelines and windswept dunes, researchers are also able to perform more precise analyses of processes shaping Titan’s surface. And Lucas suspects that the speckle noise itself, when analyzed separately, may hold information about properties of the surface and subsurface. “This new technique provides a fresh look at the data, which helps us better understand the original images,” said Stephen Wall, deputy team lead of Cassini’s radar team, which is based at NASA’s Jet Propulsion Laboratory in Pasadena, California. “With this innovative new tool, we will look for details that help us to distinguish among the different processes that shape Titan’s surface,” he said. Details about the new technique were published recently in the Journal of Geophysical Research: Planets. The Cassini-Huygens mission is a cooperative project of NASA, the European Space Agency and the Italian Space Agency. JPL, a division of the California Institute of Technology, Pasadena, manages the mission for NASA’s Science Mission Directorate in Washington. The VIMS team is based at the University of Arizona in Tucson. The radar instrument was built by JPL and the Italian Space Agency, working with team members from the US and several European countries. Presented here are side-by-side comparisons of a traditional Cassini Synthetic Aperture Radar (SAR) view and one made using a new technique for handling electronic noise that results in clearer views of Titan’s surface. The technique, called despeckling, produces images that can be easier for researchers to interpret. The view is a mosaic of SAR swaths over Ligeia Mare, one of the large hydrocarbons seas on Titan. In particular, despeckling improves the visibility of channels flowing down to the sea. 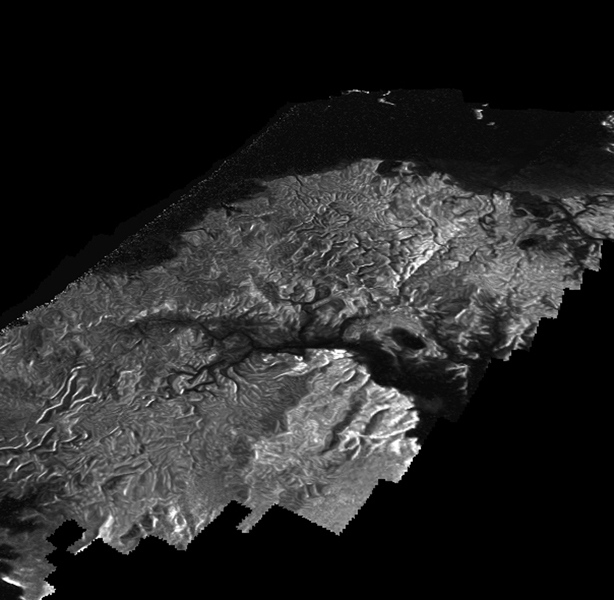 This Cassini Synthetic Aperture Radar (SAR) image is presented as a perspective view and shows a landscape near the eastern shoreline of Kraken Mare, a hydrocarbon sea in Titan’s north polar region. This image was processed using a technique for handling noise that results in clearer views that can be easier for researchers to interpret. The technique, called despeckling, also is useful for producing altimetry data and 3-D views called digital elevation maps. Scientists have used a technique called radargrammetry to determine the altitude of surface features in this view at a resolution of approximately half a mile, or 1 kilometer. The altimetry reveals that the area is smooth overall, with a maximum amplitude of 0.75 mile (1.2 kilometers) in height. The topography also shows that all observed channels flow downhill. The presence of what scientists call “knickpoints” — locations on a river where a sharp change in slope occurs — might indicate stratification in the bedrock, erosion mechanisms at work or a particular way the surface responds to runoff events, such as floods following large storms. One such knickpoint is visible just above the lower left corner, where an area of bright slopes is seen. The image was obtained during a flyby of Titan on April 10, 2007. A more traditional radar image of this area on Titan is seen in PIA19046. This montage of Cassini Synthetic Aperture Radar (SAR) images of the surface of Titan shows four examples of how a newly developed technique for handling noise results in clearer, easier to interpret views. The top row of images was produced in the manner used since the mission arrived in the Saturn system a decade ago; the row at bottom was produced using the new technique. The three leftmost image pairs show bays and spits of land in Ligea Mare, one of Titan’s large hydrocarbon seas. The rightmost pair shows a valley network along Jingpo Lacus, one of Titan’s larger northern lakes. North is toward the left in these images. Each thumbnail represents an area 70 miles (112 kilometers) wide. 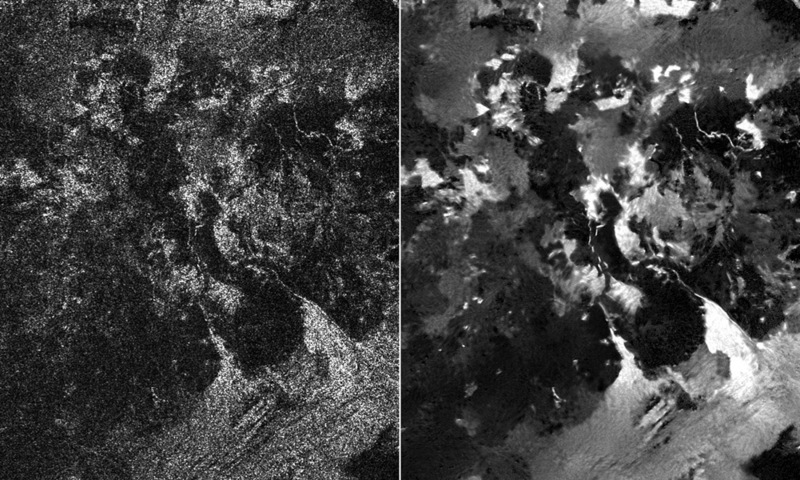 Presented here are side-by-side comparisons of a traditional Cassini Synthetic Aperture Radar (SAR) view, at left, and one made using a new technique for handling electronic noise that results in clearer views of Titan’s surface, at right. The technique, called despeckling, produces images that can be easier for researchers to interpret. The terrain seen here is in the flow region named Leilah Fluctus (55 degrees north, 80 degrees west). With the speckle noise suppressed, the overall pattern of bright and dark in the scene becomes more apparent. In particular, cone-shaped features near lower right stand out, which could be alluvial analogues on Titan — features produced by the action of rivers or floods. North is toward right in this image, which shows an area about 50 miles (80 kilometers) wide.